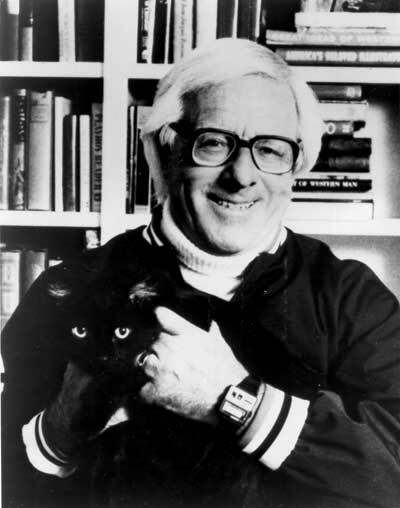 Tribute to Ray Bradbury: My Five Favorites! THE BEAST FROM 20,000 FATHOMS (1953) – I wasn’t alive yet to have seen this at the movie theater, but it was one of my favorite weekend “monster movies” when I was kid. The film is based on a short story written by Bradbury called “The Fog Horn” which premiered in 1951 and was part of a collection of stories in his book “Golden Apples of the Sun” and later sold to The Saturday Evening Post. The story deals with one of Bradbury’s favorite subjects – Dinosaurs! In the book, a lone dinosaur (who managed to survive the ages in aquatic seclusion) hears a fog horn from a lighthouse and mistakes it as a call from one of his own kind. 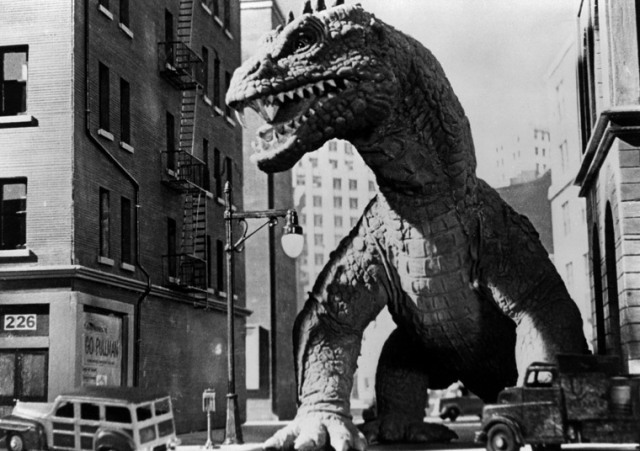 This scene would later reach the big screen in THE BEAST FROM 20,000 FATHOMS, a project that teamed him with effects genius, Ray Harryhausen. The two men had met in their teens and, as the story goes, made an early promise each other to “always be friends and never give up their love of dinosaurs.” I believe it is safe to say that they made good on both promises. BEAST FROM 20,000 FATHOMS would also be one of the inspirations of GOJIRA/GODZILLA after Japanese director, Ishiro Honda, saw the film while visiting America. As a big fan of Godzilla, it ingratiated me even more with this film as well as the writer who inspired it. 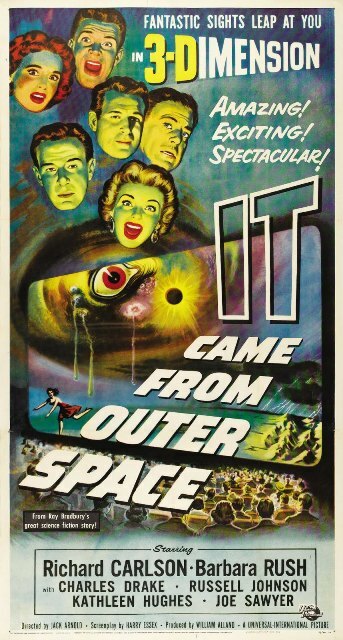 IT CAME FROM OUTER SPACE (1953) – Another story of Bradbury’s that would get the Hollywood treatment was IT CAME FROM OUTER SPACE. The story deals with aliens who accidentally crash land on Earth. While most 50’s Science Fiction films dealt with “invasions,” these aliens really didn’t want to cause any harm as much as using humans to help them get back home. This is not to suggest, however, that the story was as fluffy as E.T., this film had plenty of chills via the gelatinous looking aliens (which I still find effective) and that wonderful theremin music we fans will forever associate with the genre. 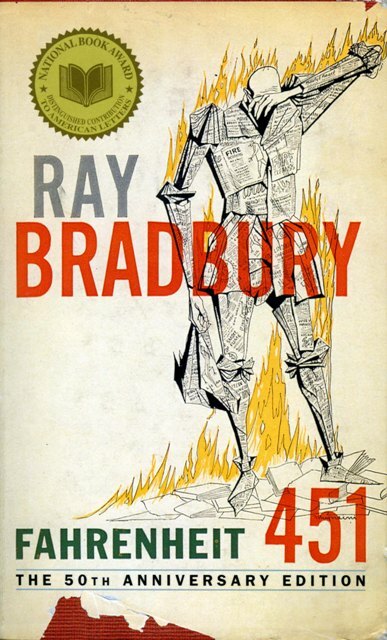 FAHRENHEIT 451 – 1953 was a stellar year for Bradbury. Aside from the release of the aforementioned films, it would also be the year he released his novel, “Fahrenheit 451.” Of the numerous books I was forced to read in English class during my High School years, this would be the only one I actually enjoyed. It deals with a futuristic society where books are outlawed – presumably because they encourage free thinking. Reading clashes with the powers that be as they prefer their populace to do other things, like watch their big screen TV’s (in this case, the size of your wall and having advertisers address you by name) and remain obedient to their consumer driven ambitions. Firemen are abundant in this society, though their jobs are not to put out fires, but rather to cause them. Offenders of the “No Books Rule” will find their entire homes burnt to a cinder if word gets out of any infraction. Interesting characters and a tense climax make this a winner. It was later made into a film, though I confess I’ve never seen it. WEIRD FANTASY #18 – I didn’t discover EC Comics until they were reprinted in the 1980’s but boy was a blown away by them! The stories and art were fantastic and worthy of a blog unto themselves. 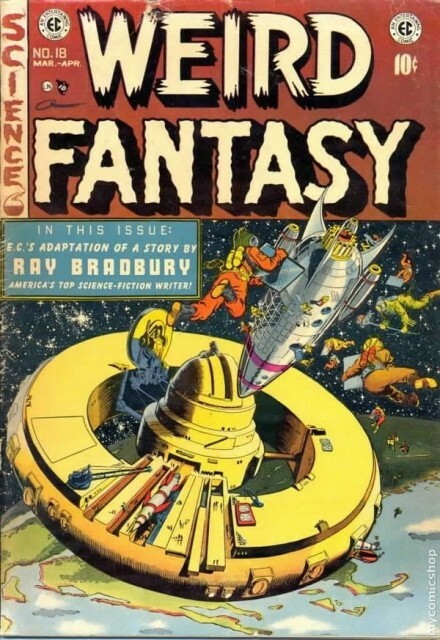 Bradbury’s stories were tailor made for this genre as proven by “Weird Fantasy #18 which saw the comic book adaption of “Judgement Day.” The story ingeniously tackles the subject of race relations (something just beginning to rise up in the 50’s) but used robots instead. A man from a futuristic Earth arrives on the planet “Cybrinia” – inhabited solely by mechanical beings. His job is to inspect this Earth-made colony to see if they are “ready.” Ready, in this case, means worthy of joining an enlightened Earth’s “Great Galactic Republic.” Black & white is orange & blue with the orange robots getting all the advantages of society while the blue ones are kept at heal. If any readers weren’t able to make the connection of this world to their own, the comic’s final frame really hits it home. This story was not only futuristic, it was downright ahead of its time! 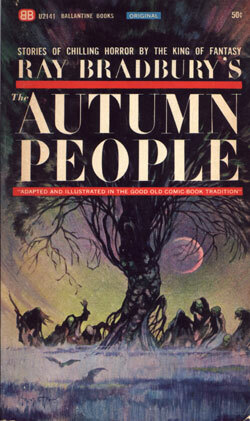 THE AUTUMN PEOPLE – EC Comics would also introduce me to a collection of Bradbury stories called “The Autumn People.” This was via the wonderful “Vault of Horror” who gave them great comic adaptations. One of the stories titled, “Let’s play poison” dealt with a school teacher who couldn’t stand his students (another sign of the future). Watching the kids play a hopscotch game called “Let’s play poison” makes him see red and illicit harsh reprimands. The kids, however, aren’t going to let a bitter old man stand in the way of recess and give him an ending worthy of any good EC Comic! And so we Daves tip our hats to the great Ray Bradbury. May your wonderful work continue to inspire the future worlds you wrote of. This entry was posted in Book Reviews, Monsters, Science Fiction, UFO and tagged Farenheit 451, Godzilla, GOJIRA, It Came from Outer Space, Ray Bradbury, The Autumn People, The Beast Fathoms, Weird Fantasy. Bookmark the permalink. ← Horror Host Tribute Song to IVONNA CADAVER! seriously Ray was a major influnce to me, like Mark Twain and Stephen King, I could go on and on with this… but He made science fiction what it is today. When I heard his paasing I was sad that I never got to meet him, or say thanks. His imagination altered how I look at this planet..forever. Great comment, Shaun! I appreciate you sharing that.